Vincent Eugene Craddock (February 11, 1935–October 12, 1971), better known as Gene Vincent, was an American musician who pioneered the styles of rock and roll and rockabilly. His 1956 top ten hit with his Blue Caps, "Be-Bop-A-Lula", is considered a significant early example of rockabilly. 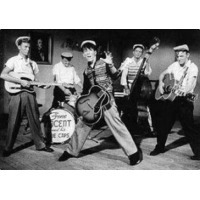 He is a member of the Rock and Roll and Rockabilly Halls of Fame.